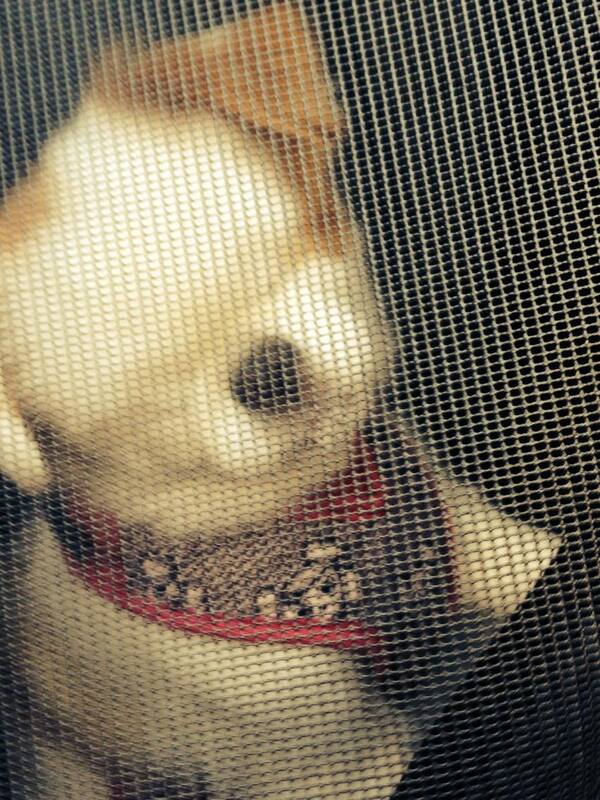 Oh, The Places This Blind Dog Goes! Today is National Dog Day and I’m taking this opportunity to showcase all the fantastic places my poor blind dog has gone in the last few months. 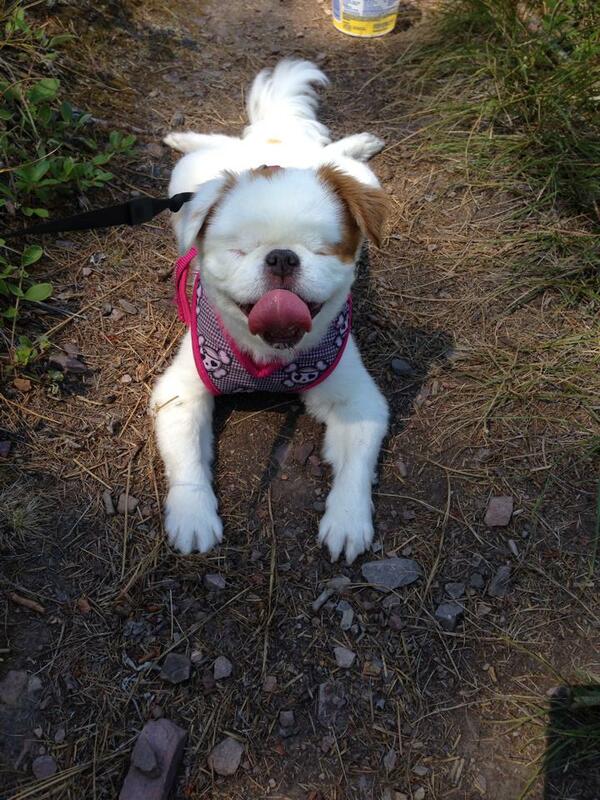 Being blind hasn’t stopped her from enjoying hikes, national parks, and camping. I bought one of those doggie carrier backpack things a few months back so that she could come on all of my hikes with me and I wouldn’t have to hold her if she got tired or the terrain was rough. Yes, I’m one of those people now. She didn’t like it at first but once she wore herself out she decided it was the best thing ever! Her first hike that involved the pack was huckleberry picking in Pattee Canyon. The path was nice and even with very few obstacles so she was able to walk all the way to our berry picking location. Once there I placed her in the pack since we were going off-trail and the bushes were about shin high. She wasn’t having that and completely wore herself out trampling all the bushes in sight, including the ones I was trying to pull berries off of. She made it back to the trail and that’s as far as she went. Next I met my mom for a quick weekend camping trip near Bighorn National Park. She was completely worn out by the end even though she spent most of the time either riding in the car or hanging out at the campsite. 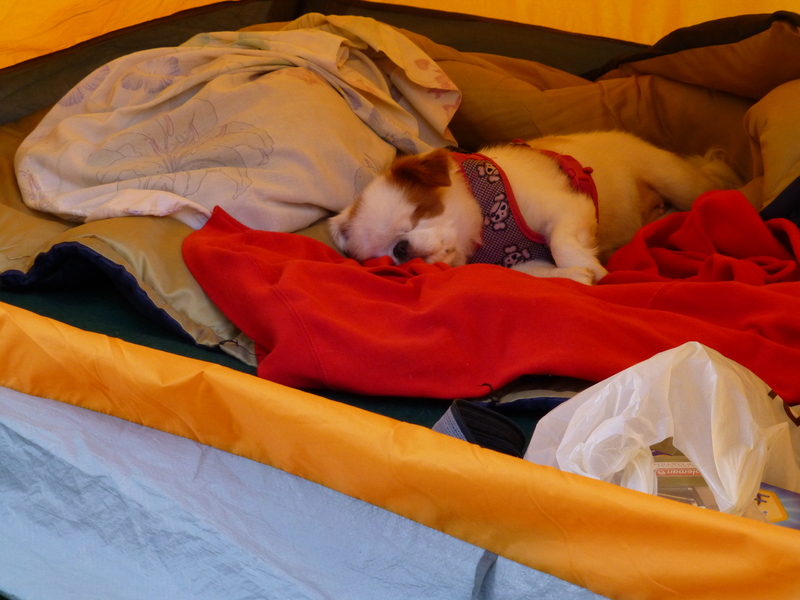 I was still able to get a good picture of her before she stumbled into the tent and crashed. 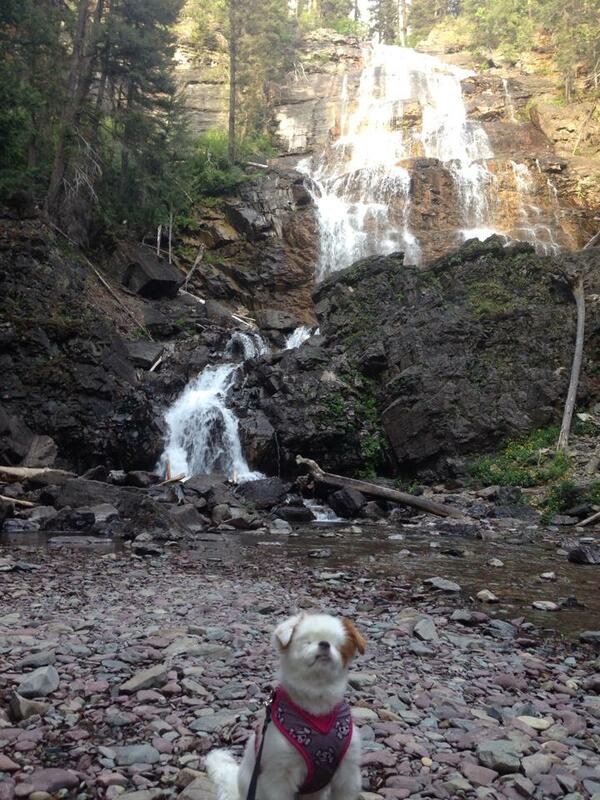 Finally, I took her to Morrell Falls by Seeley Lake. First of all, if you ever get the chance to visit Salmon Lake, do so. We simply drove by it on our way to the falls and it was absolutely stunning! I’m hoping I get the chance to spend time there before winter. Morrell Falls was not ideal for my blind dog as there were many tree roots sticking up and large rocks to step around. Miya spent 90% of the time in the backpack which she was fine with after stumbling along the path for the first quarter mile. The noise didn’t impress her in the least. This coming weekend I plan on hiking back up to the “M” on Mount Sentinel then continuing on to the summit and Miya will be tagging along the entire way, either by foot or by pack. It’s been three years since I adopted her and I love that she’s still willing to come with me on adventures even though she can’t see. Not only does she impress me but I’m usually stopped by at least three people asking about her and giving her loads of attention. I hope all of you out there with pups of your own found some way to celebrate them today. Me? I bought mine a small fry for dinner. 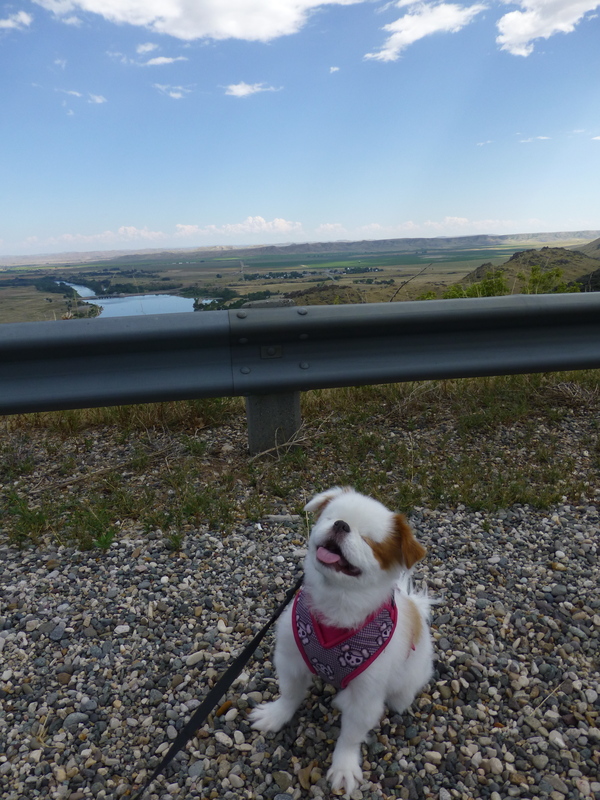 This entry was tagged author, Bighorn National Park, camping, cheryl renee hunt, hiking, lab nerd, missoula, montana, Morrell Falls, poor blind dog, Salmon Lake, Seeley Lake, traveler, writer. Bookmark the permalink. Gorgeous Pup and beautiful photos.